Advanced mesh editing operations using Laplacian coordinates: free-form deformations (a-b), coating transfer (c) and mesh transplanting (d). Representing the geometry using the Laplacian coordinates enables preservation of detail. Surface editing operations commonly require geometric details of the surface to be preserved as much as possible. We argue that geometric detail is an intrinsic property of a surface and that, consequently, surface editing is best performed by operating over an intrinsic surface representation. We provide such a representation of a surface, based on the Laplacian of the mesh, by encoding each vertex relative to its neighborhood. The Laplacian of the mesh is enhanced to be invariant to locally linearized rigid transformations and scaling. 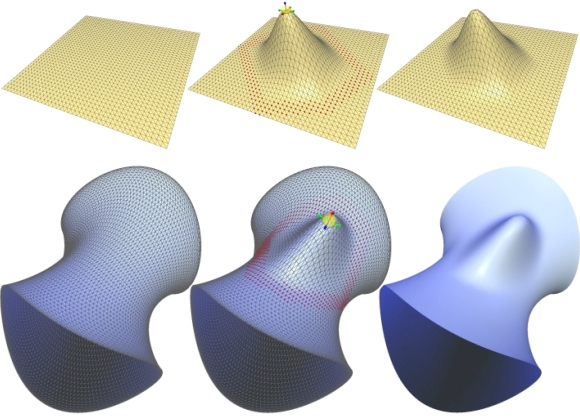 Based on this Laplacian representation, we develop useful editing operations: interactive free-form deformation in a region of interest based on the transformation of a handle, transfer and mixing of geometric details between two surfaces, and transplanting of a partial surface mesh onto another surface. The main computation involved in all operations is the solution of a sparse linear system, which can be done at interactive rates. We demonstrate the effectiveness of our approach in several examples, showing that the editing operations change the shape while respecting the structural geometric detail. A variant of Laplacian Mesh Editing is integrated into Blender starting version 2.7, it is called Laplacian Deform Modifier. You can read more about it here. The Bunny mesh consists of 35K vertices. The user defines a region of interest (ROI) and manipulates it by moving and rotating a handle. First, the entire ear was bended by marking the boundary of the ROI at the base of the ear. Next, the twist was created by reducing the ROI to contain half of the ear. The belt of anchors that surrounds the ROI is marked by red dots. 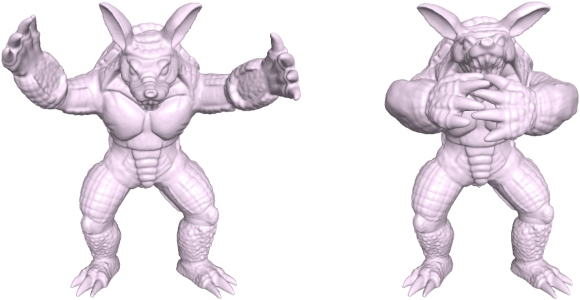 The Armadillo mesh consists of 173K vertices. The left figure shows the original model, and the interactively edited model is on the right. Smooth transition between the ROI and the rest of the mesh. The left column displays the initial meshes. In the middle column, the ROI is shown, after some manipulation of the handle. The ROI is bounded by a belt of anchor vertices, whose location is constrained in the reconstruction system. This belt ensures a graceful transition between the ROI and the unchanged remainder of the mesh (see right column). Since the surface is reconstructed by solving a least-squares system, the anchors in the belt move, but the amount of movement is small and effectively vanishes at the outer rings of the belt. The Bunny, Dragon, Armadillo and Feline models are courtesy of Stanford University and the Octopus is courtesy of Mark Pauly. This work was supported in part by the German Israel Foundation (GIF) and by grants from the Israel Science Foundation (founded by the Israel Academy of Sciences and Humanities) and the Israeli Ministry of Science.